Allen and I met for the first time at a Nashville Sounds game, so they’ve played a very special place in our hearts. We bought game worn jerseys at a charity auction for our engagement photos and a game worn jersey for the guest book at our wedding. My wedding gift to Allen was season tickets. 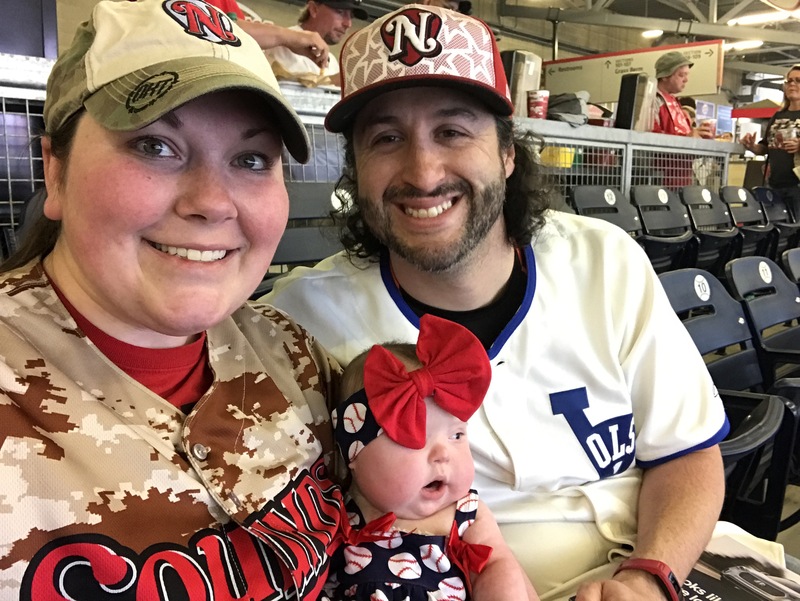 We even took pictures on the field for our adoption announcement, so the Sounds are a pretty big deal to us and we plan to share that same love for baseball with Hannah. Tuesday, April 11th was the first home opener, so of course we had to take Hannah to the game. Little did we know the weather would not be on our side. The gates opened and the rain seemed to be gone, oh were we wrong. Hannah was decked out in her baseball outfit, looking cute as ever, so she definitely was getting lots of attention. We were even asked to do an interview with one of our local news stations to talk about our excitement for the game and us being super fans. The rain started again and after an hour and a half delay we decided to go home. We may have missed the actual game, but there will be plenty more opportunities to take Hannah to games this season and show her off. She definitely was not feeling taking a family photo.